In 1991 two divers discovered the remains of a U-boat deep in the Atlantic off the New Jersey coast. But this was a U-boat that could not be there. No American, German or British records indicated a sunken or lost U-boat anywhere in the vicinity. As the mystery unfolded, I learned a great deal about deep diving to explore wrecks, U-boats, World War II action off the U.S. coast, and especially about the values and uncompromising integrity of the men who discovered, researched, and dove this wreck, not all of whom survived. 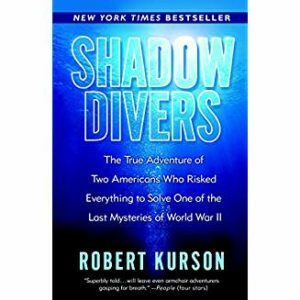 Shadow Divers is dense and rich with knowledge and mystery. This is not a book you will read in an evening. It takes thinking to read this true narrative. You will follow six years of diving and research to positively identify the U-boat’s number and crew, 1991-1997. It is, however, quite a fascinating and satisfying read, and I highly recommend it. The story is compelling, the characters are complex and real, the writing is engaging. I cried reading the Epilogue. The New Yorker describes Kurson’s writing as “adrenalized prose.” I will recommend this book to the "Casting Crew Book Club" as a 2019 read, and I recommend it to you. Thank you, Dan, for this magnificent addition to my reading list. I think Andrea’s review of Shadow Divers is the most accurate of the many fine reviews that have been written about this book. Kurson is a marvelous writer, and his latest, Rocket Men, is not to be missed. Nevertheless, it’s unlikely that he will ever surpass what he achieved with Shadow Divers. That’s quite an honor, coming from you, Dan. Thank you. Rocket Men, dear readers, is about Apollo 8. It’s now on my library list! !